In the U.S., filet mignon is a beef cut taken from the larger end of the cow's tapered tenderloin muscle. The cut is boneless, relatively lean and typically 1 to 2 inches thick. Its tender texture makes it ideal for broiling. Broiling uses radiant heat from a nearby heat source to cook food, similar to grilling, though the heat source is above the food when broiling. Read your oven's manual for brand- and model-specific broiler instructions, as proper use varies. By following your oven's directions and optimal broiling procedures, it's easy to broil the perfect filet mignon at home. Remove the broiler pan from the broiler compartment. Preheat the broiler compartment for 10 minutes. Take the rack out of the broiler pan. Line the bottom of the broiler pan with a sheet of aluminum foil to prevent drippings from the filet mignon from baking onto the pan and making cleanup difficult. Replace the rack. Dip a cooking brush or paper towel into cooking oil and rub it onto the top surface of the broiler pan's rack. Season the filet mignon to taste, or as specified by a favorite steak recipe, if you like. Keep in mind that much of the high price of filet mignon is due to its exceptional flavor, so it doesn't require any seasoning. If using herbs or spices, limit them to just a pinch to avoid masking the flavor of the meat. Lay the filet mignon on the rack of the broiler pan. Insert it into the broiler. Position 1-inch-thick cuts 2 inches from the heat source, 1 1/2-inch-thick cuts 3 inches from the heat source and 2-inch-thick cuts 4 inches from the heat source. Refer to the broiler's markings for accurate positioning. 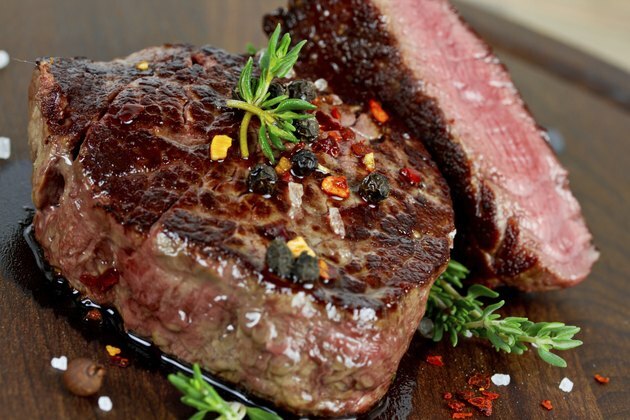 Cook a filet mignon to no more than medium, but preferably medium rare. Further cooking has detrimental effects on the meat's flavor, moistness and texture. However, definitions of "perfect" differ, obviously. Expect it to take 13 minutes to broil a 1-inch-thick filet mignon to medium rare, or 16 minutes to medium. Thicker cuts require a few more minutes. Use the desired final temperature and thickness of the meat to estimate a total cooking time. Turn the filet mignon over once with tongs or a spatula halfway through the estimated cooking time. Avoid using a fork or other sharp implement that may pierce the meat, as holes allow juices to escape from the beef. Test the filet mignon's internal temperature with a meat thermometer as the estimated cooking time draws close to an end. Remove the beef from the broiler at 120 degrees Fahrenheit for rare, 130 degrees for medium rare, 140 degrees for medium, 150 degrees for medium well and 160 degrees for well done. Transfer the filet mignon from the broiler pan to a plate and let it rest for five minutes before serving. Top the steak with a dash of table or sea salt to bring out the meat's flavor. Unlike in the oven, you don't set the temperature in the broiler compartment. You control the cooking instead by how close to the heat source you position the food. A few parts of the broiling process commonly vary by oven. For instance, some broilers do not require preheating, some broiler pans should not be lined with aluminum foil and some electric oven doors do not need to be left ajar during broiling. Such variances are why you must review the instruction manual before using the broiler.